May 31, 2008 by d.
Since YL is blurmonkey, i made her a Munky from Aranzi Aronzo’s Cute Dolls. oh my. i love ur blog! pls update more. by the way, i’ve linked u on mine. hope u don’t mind. 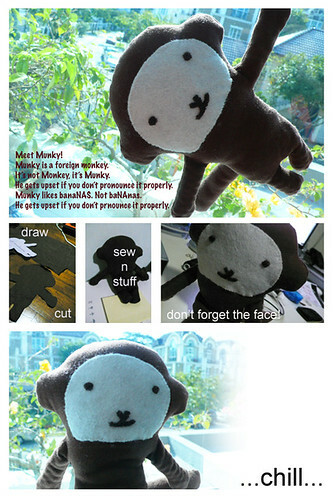 Munky’s cute stuff! i think i also want to make one. hahahahah. I’l make Pigsy. Or little lamb. Got or not huh? I like Munky! Not voodoo at all! ps. set it to require a verification code so you don’t get spam comments. on June 1, 2008 at 2:37 pm | Reply dee.